Banner space is now available on the LIXI website for advertising purposes for LIXI members and licensees. To advertise on the LIXI website, complete the LIXI Banner Advertising Agreement and send it to admin@lixi.org.au. LIXI will be in touch regarding your request. LIXI is firmly established as the number one business enabler in the lending market. Major benefits are delivered to organisations which embed the XML standards in their processing activities and business processess LIXI’s reputation attracts interest from non-members within the lending supply chain as well as businesses from similar industries, overseas companies and standards bodies. 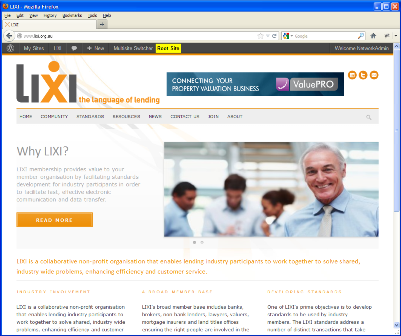 LIXI website visitors span the full range of the corporate structure along the lending chain, from CEOs to operations managers and developers. Based on the page visiting patterns, their interests are focused on the role of LIXI in the industry, working papers and case studies, the LIXI@Work newsletter, software, the latest news and who is a member of LIXI.